It’s important to check that your new sofa or chair will fit into your home, as inability to access a chosen room is the biggest cause of disappointment when purchasing furniture. 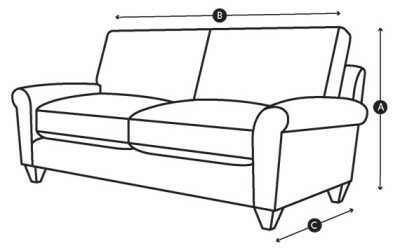 Please read our simple measuring guide to ensure that we can successfully deliver your sofa. You can find the height, width and depth and seat height for each sofa on the relevant product page. Take a note of the height (A), width (B) and depth (C). 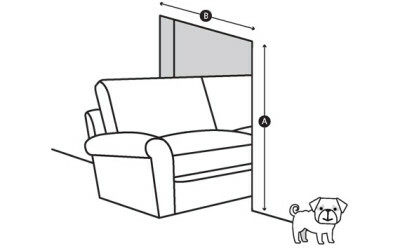 To make sure your new sofa will get through your front door, you’ll need to measure the doors height (A) and width (B). Check that the width of your door is greater than the height of the sofa, allowing a bit of room either side. Remember to measure any other doors that sofa will have to go through. The legs of our sofas (excluding Lola and Sophia) will be removed for delivery, meaning the total height will actually be slightly less than stated. If you'd like the specific height of the legs on your sofa, please contact us. Measure from your hallway wall, opposite to the entrance of the chosen room and make sure there’s enough room to manoeuvre the sofa into your room of choice and make sure the narrowest door width (A) will accommodate. Remember to take account of any radiators, shelves, skirting boards or light fittings that may get in your way - make a note of the narrowest point (B). If you’ve got to get around the corner, measure the space at its narrowest point to make sure the width is greater than the height of your sofa. 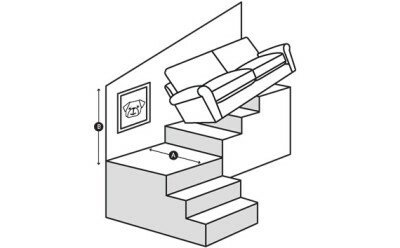 If your sofa needs to go upstairs, measure the width of the staircase at its narrowest point (A). Don’t forget to take any handrails, banisters and light fittings into account and also consider the height of the stairwell. 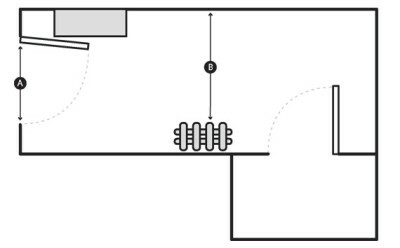 If your sofa needs to be lifted over the banister, please make sure that the space between the banister and the ceiling is greater than the depth of your sofa (B). If your stairs go round a corner, make sure there is enough ceiling height to bring the sofa upright. Distance between the stairs and the ceiling should be greater than the width of your sofa. Once the sofa is up the stairs, make sure there is enough room on the landing to accommodate it. 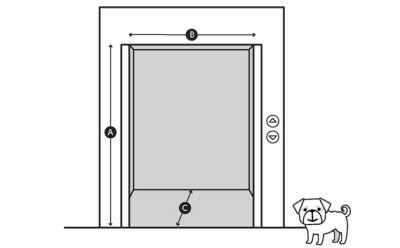 If your building has a lift that our delivery team will need to use, you’ll need to measure the height (A), width (B) and depth (C) of the lift’s interior and the size of its door. Download this guide to help you measure up.